Fire and rain: what makes a woodland? One of the most famous historical quotes on vegetation dynamics in Australia is Thomas Mitchell’s passage on fire, grass and trees. Whether he was completely right or bizarrely deluded is almost irrelevant. Mitchell’s genius lay in linking sensitive observations of indigenous people and ecosystem dynamics, at a time when such subtleties were rare. He earns a gong for putting down the first big hypothesis (not the first big fact) about the role of disturbance in Australian ecosystems. We can address this question in many ways. We can develop computer models, and we can run experiments to see how ecosystems respond to different fire regimes. Or, simpler still, we can record the outcomes from ‘natural experiments’, by comparing vegetation patterns between areas with different fire histories. Prickly Bursaria in a Cumberland Plain woodland. Source: RBGS. Despite their simplicity, natural experiments are surprisingly rare in grassy woodlands in southern Australia. In a good example, Penny Watson showed that Prickly Bursaria (Bursaria spinosa) forms a dense understorey in rarely burnt woodlands on the Cumberland plain near Sydney, but is sparse in frequently burnt woodlands, where grasses dominate. Thus, in woodlands on the Cumberland plain, fire frequency controls the abundance of understorey shrubs, as Mitchell suggested. Unfortunately, at global scales, we can’t easily run huge fire experiments, so ecologists often use correlative studies to uncover relationships between global patterns of vegetation, rainfall and fire. Correlations can’t tell us what caused the observed patterns, but they can uncover patterns that we were otherwise unaware of. In a recent issue of the journal Science, two great papers use correlative approaches to see how fire and climate interact to control global vegetation patterns. In one study, Marina Hirota and colleagues used global maps of vegetation and rainfall to understand ecosystem dynamics in tropical Australia, Africa and South America. At the global scale, the major driver of vegetation patterns is rainfall. Before I read the paper, I’d have guessed that, if I drove from a dry region to a wet region, I’d see tree cover steadily increase as the climate got wetter and wetter. At a general level, the authors found that this does happen. Extremely dry areas (< 300 mm annual rainfall) usually support treeless grasslands while, at the other extreme, dense forests are common in the wettest areas (> 2400 mm rainfall). Nothing surprising there. But in between, something really interesting happens. Tree cover does increase as rainfall increases, but it doesn’t increase steadily, and some cover classes are extremely rare at the global scale. Thus, tree cover tends to ‘jump’ from some levels to others rather than increase gradually. In eco-speak, the relationship between tree cover and rainfall is not linear, and there are rapid, non-linear transitions in tree cover at certain threshold levels of tree cover. 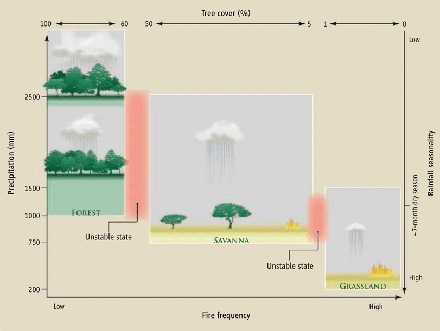 Forests, savannas and grasslands occur in regions with different rainfall and fire patterns (Mayer & Khalyani 2011). As a result, we tend to find three discrete vegetation types: treeless grasslands (with 0-1% cover), open savanna woodlands (5-50% cover) and dense closed forests (>60% cover). But very, very few areas have intermediate levels of tree cover between these three states. The most surprising finding from the study is that so few areas in tropical Africa, Australia and South America have 1-5% tree cover or 50-60% cover. Why would this be the case? Clearly, each of the three widespread ecosystems (grasslands, savannahs and forests) must be very stable, as they are so abundant. By contrast, the two rare, intermediate configurations (1-5% cover and 50-60% cover) must be very unstable, otherwise we’d expect to see them much more often. Whenever tree cover approaches 50-60%, some process must act to make tree cover quickly increase (to form a forest) or decrease (to form a savanna woodland). As our historical hypothesis generator, Thomas Mitchell noted, fire is an obvious candidate. Flammable grasses dominate the ground layer in open savannah woodlands. These grasses carry frequent fires that kill tree seedlings and prevent dense forests from forming. Frequent fires in savannah woodlands maintain open savannah woodlands, and may prevent tree cover from increasing into the unstable 50-60% cover range. By contrast, dense forests have little grass, so fire cannot easily penetrate forest stands. Gaps that open up when trees die may quickly be filled by new trees. In unburnt forests, rapid gap filling may prevent tree cover from declining into the unstable 50-60% range. Savanna fires often kill woody plant seedlings and prevent tree encroachment. Source: ABC News. As I described in an earlier blog, this feedback between vegetation and fires drives the formation of ‘alternative stable states’. In their new paper, Hirota and colleagues demonstrate that, at a global scale, feedback mechanisms prevent the formation of unstable, intermediate states, to a degree far greater than was previously known. The second paper, by Carla Staver and co-workers, addresses a similar question. They also used global data on vegetation, rainfall, soils and fires to tease apart the influence of fire and rainfall on vegetation patterns. At the broad scale, they showed much the same patterns as Hirota and co. They also showed major differences between Australia and the other two continents. In their words, “At intermediate rainfall, where both savanna and forest occurred on other continents, Australia was dominated by savanna.” (Staver et al. 2011, p. 231). This raises the obvious question, why don’t dense forests occur in ‘intermediate rainfall’ areas (1000-2500 mm) in Australia? Staver found that dense forests need more than just high rainfall. Across all three continents, forests occur where there is more than 1000 mm of rain each year and where this rain falls across most of the year. Dense forests hardly ever occur where the dry season lasts for half a year or more. Staver and colleagues concluded that a long dry season prevents forest from forming in high rainfall areas in northern Australia. The climate in northern Australia is dominated by the monsoon, which delivers torrential rainfall in a few short months, and hot, dry weather for the rest of the year. The authors suggest that the monsoonal climate, and the long dry seasons it creates, prevents the development of dense forests across northern Australia. Staver’s map of climatic biomes in South America, Africa and Australia (Staver et al. 2011). The continental differences in rainfall and vegetation patterns can be seen in the above map from Staver’s Science paper. The ‘deterministic forest’ zone (shown in dark green) has mean annual rainfall > 2500 mm. This climate nearly always produces forests. This zone is conspicuously absent from northern Australia. At the other extreme, the ‘deterministic low tree cover’ zone (pale orange) has low rainfall (< 1000 mm a year) or strongly seasonal rainfall (dry season > 7 months long). Tree cover is nearly always low in this zone. This zone is common on all three continents, but occupies nearly all of northern and central Australia. The two ‘bistable zones’ have the same rainfall (mildly seasonal, 1000-2500 mm) and currently support either forest (light green) or open savanna (dark orange). The two ‘bistable zones’ are where ‘alternative stable states’ can form. Where fires are frequent, open savannahs occur, and where they are rare, closed forests form. So what do these two studies tell us about Mitchell’s hypothesis, about the relative importance of climate and fire in controlling vegetation patterns? At one level, the papers appear to address Mitchell’s hypothesis really well. In some parts of the globe, fire plays a big role in controlling tree cover. In other regions, it’s not at all important. But – and this is a big but – there’s a limit to how far we can push this argument. Both studies suggest that climate, not fire, prevents the development of closed forests in northern Australia. But they don’t tell us how (or why) climate prevents dense forests from forming in high rainfall, monsoonal areas of northern Australia. Lightning from monsoonal storms lights many fires in northern Australia. The monsoon delivers many things. It delivers a heap of water in a few, short months. It delivers a long dry period. And it also delivers a lot of lightning. This lightning starts lots of fires, which burn vast areas. Staver and colleagues note that, ‘on all three continents, fire was ubiquitously present in savanna’. Unfortunately, these two great papers can’t tell us whether there are few dense forests in monsoonal Australia because the monsoon delivers a long dry season or because the monsoon delivers a lot of fires or both factors. And the monsoon does deliver a lot of fires. We often hear that south-east Australia and California are among ‘the most fire prone’ areas in the world. Both areas have very severe fires, but the extent and frequency of fires in these areas are trivial compared to fires in northern Australia. The video below from NASA demonstrates the ubiquity of fires in monsoonal northern Australia. It’s an extraordinary show. Over 160 years ago, Thomas Mitchell raised a big question that continues to tax the brains of some of the world’s best ecologists – how important are disturbances such as fire and grazing in controlling global vegetation patterns? Nowadays, satellite images and videos provide a global view of vegetation, climate and fire. But we still haven’t nailed the issue. Will ecologists still try to answer it in the future? Who knows. And who knows what amazing technology they’ll have to help them in another 160 years time. Hirota M, Holmgren M, Van Nes EH & Scheffer M (2011). Global resilience of tropical forest and savanna to critical transitions. Science 334, 232-235. Mayer AL & Khalyani AH (2011). Grass trumps trees with fire. Science 334, 188-189. Staver AC, Archibald S & Levin SA (2011). The global extent and determinants of savanna and forest as alternative biome states. Science 334, 230-232. Watson PJ, Bradstock RA & Morris EC (2009). Fire frequency influences composition and structure of the shrub layer in an Australian subcoastal temperate grassy woodland. Austral Ecology 34, 218–232. Click the button to receive an email when a new story is posted. Ian Lunt Ecology: Science & Nature Writing by Ian Lunt is licensed under a Creative Commons Attribution-NonCommercial-NoDerivatives 4.0 International License.